This innovatively designed crossbow is a perfect match for hunters, rifle shooters, and beginning or experienced crossbow users alike. With state-of-the-art, customizable features, the Risen XT 350 offers a cohesive crossbow system users can tailor to their needs. 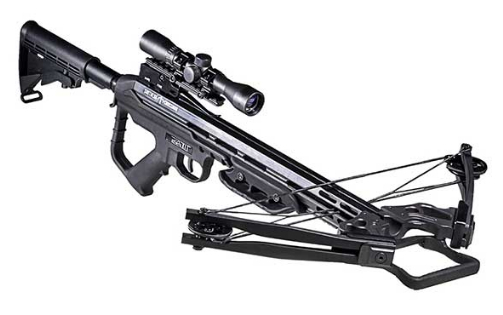 Modeled similar to a tactical weapon’s platform, the Risen XT 350 allows users to transition from gun to bow with ease. Equipped with a unique, customizable AR platform with both picatinny and weaver rails, users have the ability to mount flashlights, lasers, sights, and night vision riflescopes or any other tactical accessory that can be applied to an AR platform. Along with a collapsible, tactical stock and an adjustable vertical fore-grip, users can modify it to fit their body and position. The Risen XT 350’s ergonomic design offers exceptional power and durability with its compound levering system, split limb design, sturdy fore-grip and 180-pound draw weight. Weighing in at 8 lbs. 12 oz., its quiet cams and 350 fps arrow speed ensure a quick and stealthy kill for every shot. Arrow Length: 20" and 22"